I surprised myself by reading seven books in the short month of February. I’m having a good time reading a variety of books this year and stretching my subject matter a little. The Underground Railroad, by Colson Whitehead, was the first book I read in February. It had been on my reading list since last summer. After having been on the wait list for it at the public library for weeks, it just happened to rise to the top and come to my Kindle Fire the day before I finished reading Glory Over Everything, by Kathleen Grissom in January https://janetswritingblog.com/2017/02/03/what-i-read-in-january-2017/. While I was still in an Underground Railroad frame of mind, I got to read Mr. Whitehead’s book. As with Glory Over Everything, I highly recommend The Underground Railroad. Both books were well-researched and well-written – just what fans of historical fiction love. In Search of Mockingbird was a huge switch in gears for me. I’d read about the book and, although it was a YA (Young Adult) novel, I was intrigued by the premise. It was worth checking out from the public library just to see how a YA book is written and to see how Ms. Ellsworth developed the story. Erin runs away from home on the eve of her 16th birthday. She is angry with her father for waiting until that day to give her the diary that her late mother write. Erin’s favorite book is To Kill a Mockingbird and her heart’s desire is to meet Harper Lee. The diary reveals that Erin’s mother, who died when Erin was one week old, aspired to be a writer. Erin wants to be a written, too. The revelation that her mother wanted to be a writer and also loved To Kill a Mockingbird – along with her anger that her father waited 16 years to tell her about the diary – propel Erin to runaway from home in Minnesota and buy a bus ticket to Monroeville, Alabama to try to meet Harper Lee. Along the way she befriends some interesting people and learns some valuable lessons even while she teaches those new and older acquaintances some life lessons. This is a delightful book in which Ann Patchett humorously tells what she has learned about the craft and art of writing. She is quick to caution that every writer must find his own writing process, but she tells what she has done that worked and what did not work. I found myself highlighting many of her experience gems. I thoroughly enjoyed this book, and I know I will refer back to it often to reread the sentences and paragraphs I highlighted. 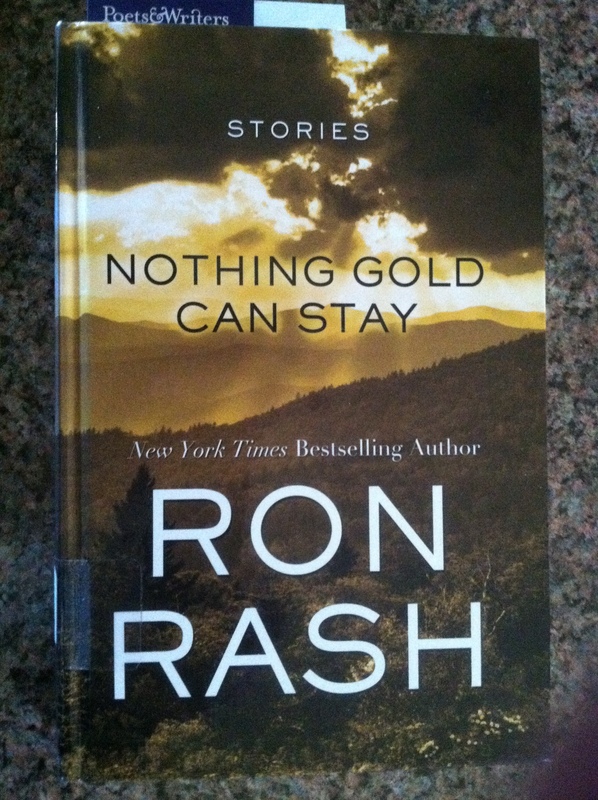 This collection of 14 short stories by Ron Rash was a delight. When my book club read his novel, Serena, several years ago, I was the only person in the group that liked it. I haven’t enjoyed any of his other novels as much. Since one of my goals in 1027 is to read a short story every week, I decided to check Nothing Gold Can Stay out of the public library. I haven’t read many short stories in a long time, and I was pleasantly surprised by my journey back into them. If you like authentic Appalachian Mountains fiction, I think you’ll like this collection of stories. This political thriller presents a cloak-and-dagger scenario about the Federal Reserve and its far-reaching power and influence within and outside the USA. Published in 2012, it weaves together the timely concerns of terrorism and the financial crisis in the USA. Mr. de Castrique keeps the reader guessing who knows what and who the “good guys” and “bad guys” are. Russell “Rusty” Mullins, a former Secret Service agent, is the protagonist Mr. de Castrique introduces in The 13th Target. This is Mark de Castrique’s second political thriller. If you follow my blog, you’ll recall that he and this book were the topic of my blog post on February 28 https://janetswritingblog.com/2017/02/28/author-visit-from-mark-de-castrique/. Mr. de Castrique was the guest speaker at the February meeting of Rocky River Readers Book Club on February 27. The Singularity Race stands alone, but you might want to read The 13th Target first in order to meet the main character, Russell “Rusty” Mullins. 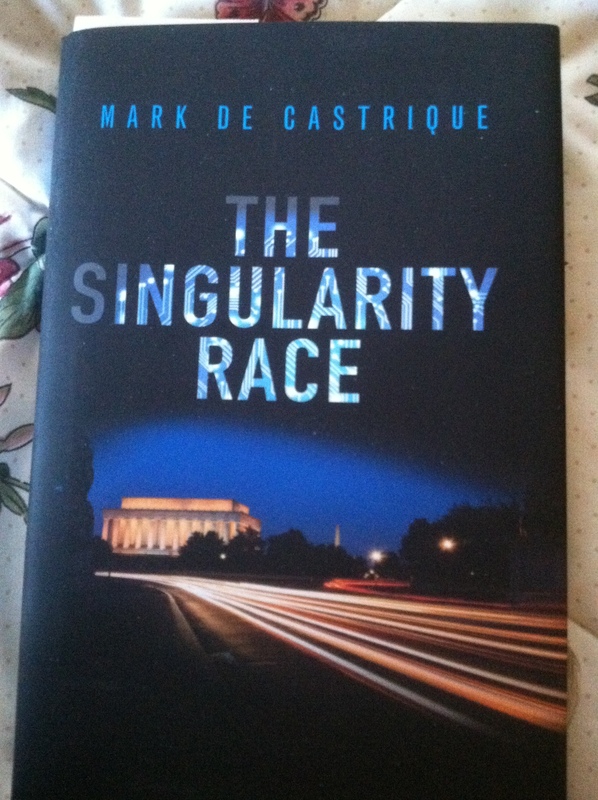 In The Singularity Race, the former Secret Service agent gets involved in an artificial intelligence case in which someone is trying to kill a Chinese computer expert visiting the USA. I am a dog lover from before I can remember. There is a black-and-white photo of a two- or three-year-old Janet crying her eyes out while burying her face in the thick fur of her brother’s collie named Pal. I am told that Pal was my go-to guy any time I got my feelings hurt. My life has been blessed and enriched by a wonderful line of family dogs, so I was drawn to this book. When my dog is smelling something and refusing to come to me, he’s not being obstinate; he’s on brain overload. Dogs are not color blind; they can see shades of green and blue. A dog has much better peripheral vision than a human. Although a dog’s fully-developed hearing allows it to hear at a frequency of 45,000 hertz – more than twice the frequency heard by humans – puppies are deaf when born. Oh — and the secret language of dogs? I learned that when my dog goes belly-up, he’s not asking for a tummy rub; he’s saying, “I want to be left alone!” Oh dear! In addition to the above books, I read at least one poem every day. Poets such as Robert Louis Stevenson; Elizabeth Barrett Browning; Carl Sandburg; George Darley; Robert Burns; William Wordsworth; William Shakespeare; and Ella Wheeler Wilcox. I also read The Gospel of Mark and half of The Gospel of Luke. I feel like my blog readers are holding me accountable on reading a chapter in the Bible every day. I’ve tried many new years to do that, but I’ve never made it all the way through 365 days. This year, so far, so good! I’m interested to know what you are reading or have read recently. Feel free to leave a comment or connect with me on social media. I’ve had months like that, too, Chris. March is a new month. READ!